The Manawatu Mustang Owners Club was formed in late January 1979 when a couple (Ash & Louise Williams) with a passion for Mustangs hosted 15 Mustangs, 8 of those guests from the Taranaki Club with the aim of starting a club. The first official meeting took place on 14th February 1979 at Graeme and Trudie Ponds home where the 7 foundation members started the club. The club has constantly grown in numbers over the years as Mustangs become the passion of more and more New Zealanders. As at April 2013 the club had 80 family members. Members together own 85 Mustangs. Almost every month there are new additions to the club, either new members or another vehicle purchased. 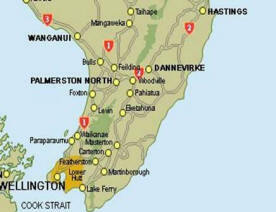 Membership is drawn from all over the lower half of the North Island, from Wanganui and Hastings south to Wellington. The club meets for some kind of event about once a month, in various places in the Lower North Island, (See Coming Events). The club magazine is called Mustang Magic, and it is published approx 4 times per year. or can join the club by clicking the link below, then emailing, or printing and posting in the application form. Club jackets and other club merchandise are listed here.